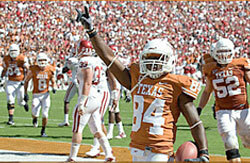 Texas wide receiver and world class long jumper Marquise Goodwin is coming back to the Texas football team. Goodwin was originally going to sit out and redshirt this season to focus on his Olympic dreams, but after watching the Rice game Saturday he texted Coach Mack Brown and told him he wanted to come back to the team. He’ll back on the practice field tomorrow with the rest of the team. Goodwin’s return is a huge boost to a very young (but talented) receiving corps. Goodwin probably slots behind Mike Davis and freshman Jaxon Shipley but he’ll bring gamebreaking speed and good hands to a team that can never get enough of either. He’ll look great running the jet sweep. Goodwin’s junior season in track and field was a stellar one as he won the U.S. Outdoor National title, set the UT indoor school record in the event, earned three First Team All-America honors and swept the Big 12 long jump titles. Goodwin leaped 27-4 to claim the U.S. title in the long jump and earn a spot in the World Championships. Competing at that meet in Daegu, Korea last week, he finished 13th in the qualifying rounds with a leap of 26-3.75 (8.02m). The top 12 finishers advanced to the final round, but despite being tied with the 11th and 12th-place jumpers, he did not advance due to a tiebreaker based on next best jump. Prior to the World Championships, Goodwin captured the silver medal on the final day of the 2011 World University Games with a jump of 26-4.25 (8.03m) in Shenzhen, China in August. Four of Texas’ incredible crew of 2010 wide receiver recruits hail from the DFW area. They’re already talking to each other and they know that they better show up ready to play. 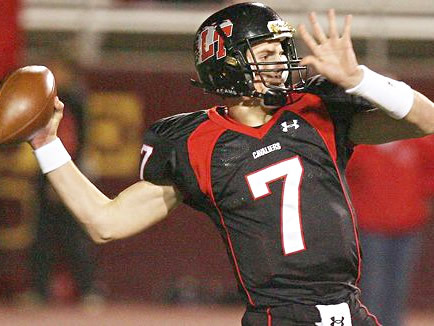 Lake Travis' Garrett Gilbert will continue the spread quarterback lineage at Texas. ESPN has several excellent articles this week on the spread offense in college football and some on it’s origins as well. Their articles feature Longhorn QB’s all over, from several generations. They think the perfect spread quarterback starts with Colt McCoy’s accurate arm and their history article gives a lot of love to future Horn [tag]Garrett Gilbert[/tag] and former Horn and current UNT coach [tag]Todd Dodge[/tag]. Who runs the spread offense? The Texas Longhorns gave us the first real look at what next year’s team is going to look like on Sunday for the Spring Game. Of course these games need to be taken with a grain of salt because both sides bring vanilla game plans. [tag]Sergio Kindle[/tag] didn’t play very much, but the defense dominated for most of the scrimmage. Here are five things we learned from the game. 1. The secondary has grown up. A few months removed from being the perceived weak link of the defense the Longhorn secondary dominated the offense the whole game. The defense played predominately out of the 4-2-5 and showed very little blitzes but they made plays. Last year the group had troubles creating turnovers but the safeties intercepted two passes, the first by [tag]Nolan Brewster[/tag] against the second team offense. The second interception was the play of day, a pick six by [tag]Earl Thomas[/tag] off of [tag]Colt McCoy[/tag]. Thomas was far and away the best player on the field on Sunday. The sophomore was everywhere, he showed off his coverage ability, he was a sure tackler, and show off his speed by running down a kick returner. Texas has four safeties that could start and all of them have at least three years of eligibility left. The corners looked good too. [tag]Aaron Williams[/tag] and [tag]Chykie Brown[/tag] have an opportunity to leave campus as the best duo Texas has had at cornerback. Add [tag]Curtis Brown[/tag] and [tag]Deon Beasley[/tag] and this group is deep and athletic. [tag]Will Muschamp[/tag] couldn’t blitz as much as he might have liked last year because of the inexperience in the secondary, but the training wheels will come off this season. And it may just be scary good. 2. The tight end position is on life support. It is true that this program has been spoiled at the tight end position in recent memory. It didn’t look like that was going to change with the emergence of [tag]Blaine Irby[/tag]. A horrific injury to Irby, a few injuries to the back ups, and a few misses in recruiting later and we’re left with the current situation. [tag]Ian Harris[/tag] bobbled a ball to cause the first interception of the game and [tag]Greg Smith[/tag] almost did the same later on. Right now it looks like Texas may have to use the four or five receiver set as their base offense this year when they really want to move the ball. Mack Brown is hesitant to abandon the run, but having a tight end on the field is becoming a liability. Irby is nowhere close to be being back, and there is no guarantee he will ever be the same if or when does get back. Maybe if [tag]DJ Grant[/tag] gets healthy or one of the two incoming freshman come in ready to contribute the position has a chance. But as we stand right now Greg Davis really needs to think about using the offense he used in the second half against Oklahoma for the majority of the snaps. Luckily Texas has the receivers to play that set with no problem. In fact keeping one of them on the sideline in favor of the current tight end on the roster is a form of football dyslexia. Both [tag]Vondrell McGee[/tag] and [tag]Foswhitt Whittaker[/tag] found the endzone on Sunday, and each showed a few flashes of their potential with the ball in their hands. But Texas averaged less than 3.0 yards per carry. Before his hamstring injury in the second half of the spring coaches and insiders had been raving about Johnson’s progress both running the ball and dedicating himself to being in shape. The knock on Johnson has always been his weight, but right now the coaching staff has decided to worry more about his body fat. Johnson is going to be counted on as the every down back if he can prove he can handle it. Right now Whittaker offers the team the skills needed in a third down back as long as he can prove he’ll block blitzing linebackers. Where that leads McGee is anybody’s guess, but with a good summer and fall practice it couldn’t be a total shock to see him get the opening day start. The variable in the whole situation is incoming freshman [tag]Chris Whaley[/tag]. The big back from Madisonville just participated in the 100M at the Texas Relays and by all accounts the young man is an athletic specimen. The staff was so high on him as a running back, many experts project him to outgrow the position that they chose not to recruit another one. If he reports in shape and ready to take the punishment he will be given every opportunity to win the job. If all else fails the Texas offense may look like something from Lubbock. Is that a bad thing? I can’t decide. 4. Colt McCoy will have plenty of targets. Texas’ leading returning receiver, and Colt McCoy’s roommate and fishing buddy if you haven’t heard, [tag]Jordan Shipley[/tag] didn’t participate in spring practices to recover from injury the Longhorns fielded maybe the best trio of receivers ever at Texas. None of the wide outs are on the level of Roy Williams, but collectively this group may be better than the BJ Johnson and Sloan Thomas group. They weren’t as highly recruited but [tag]Malcolm Williams[/tag], [tag]Brandon Collins[/tag], and [tag]James Kirkendoll[/tag] all bring something different to the field and they work great in this offense. The quarterbacks struggled with the wind, and the secondary had seen all the patterns every day in practice, but it was obvious how much big play potential will be on the field at all times. Kirkendoll showed off his speed on a reverse, Collins works the middle beautifully and led the team in yards, and Williams can get deep whenever he wants. McCoy’s bugaboo has been the deep ball and twice he nearly missed huge plays on the outside deep down the field with Williams. One was completed but the ball was too far outside to be kept in bounds and the other was thrown a little too far in front of the streaking Williams. The sophomore just looks the part out there in his number 9 uniform. Williams, fellow receiver [tag]Dan Buckner[/tag], and Aaron Williams just jump out at you from a pure athletic stand point when you look at their physique. Watching this group work has to put a smile on the Longhorn nation’s faces because they will be on campus for a few more years. That’s not even taking into account Buckner, [tag]John Chiles[/tag], and the red-shirt freshman on campus. With the questions at tight end and in the running game the receiver becomes the most important position besides quarterback for this offense. 5. Texas football is in good hands. Mack Brown has been the best thing that has happened to this program, and maybe to the University as a whole from an athletic standpoint, than anybody since Darrell K. Royal. With as good as Brown has been, head coach to be Will Muschamp has injected an energy into this program that needed a little jumpstart following the departure of Vince Young and the rest of the 2002 recruiting class. With one hire, and Brown deserves credit for making it and then realizing he couldn’t lose his personal energizer bunny on Red Bull, the stigma of Texas being soft or unmotivated was erased for the present future. Just a few years ago these Spring Jamborees were offensive exhibitions. Remember when the opening kickoff was returned for a touchdown every year? That won’t happen anymore. Muschamp has made everything competitive. He has given the defense pride, and more importantly, thanks to Brown he has given them stability. A stability that the offense has had the luxury of since Brown and Greg Davis arrived on campus. For the first time in a decade the defense is going to have a steady hand leading the way. With Muschamp the hand might not be steady, it may be pumping up and down, but I’ll take it.